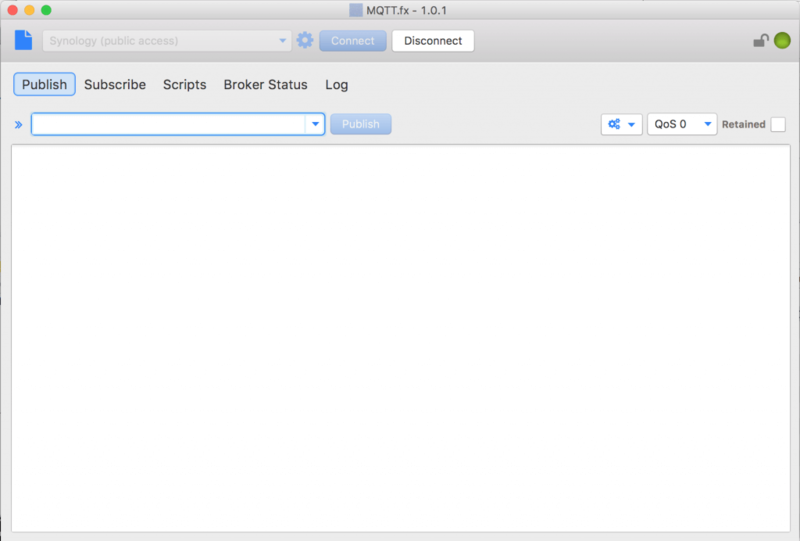 MQTT.fx aims to be an quick and easy to use desktop tool for MQTT debugging and testing. Since about 2 years it is continuously extended (and bug-fixed) by Jens Deters. 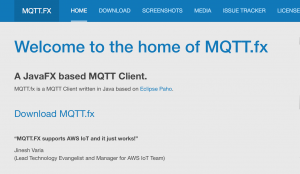 MQTT.fx is the recommended tool for Amazon Web Services IoT quickstart. 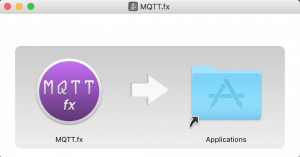 Furthermore there is a tutorial by Lady Ada to use MQTT.fx as Desktop MQTT Client for Adafruit.io. 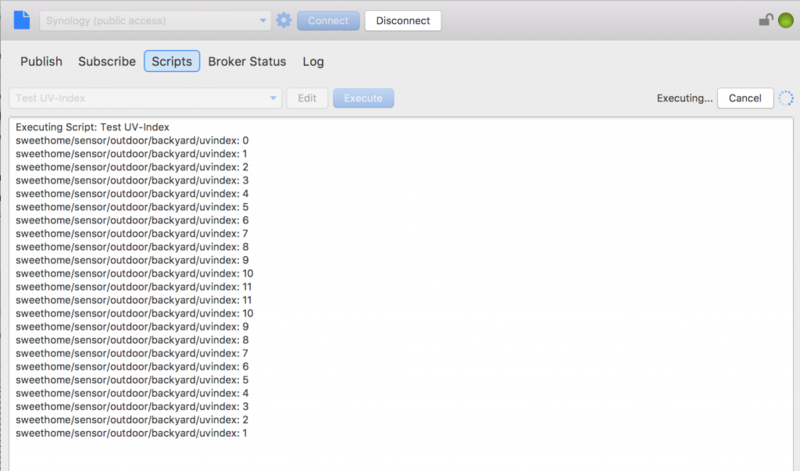 At the top of the main window you find the options to edit the broker connection profiles and to connect / disconnect to a broker based on the chooses method (ad-hoc or via profile). 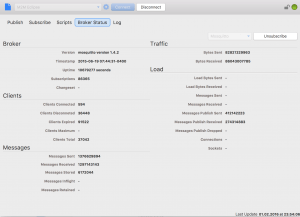 Each major use case has its own tab: Publish, Subscribe, Scripts, Broker Status, Log. The Tabs are detachable so each tab content can be separated in a window. So a „publish“ windows can be placed next to „subscribe/receive“. If you close such a window it is moving back as a tab at the former position. To connect to a broker there are basically two options: ad-hoc or via the profile. 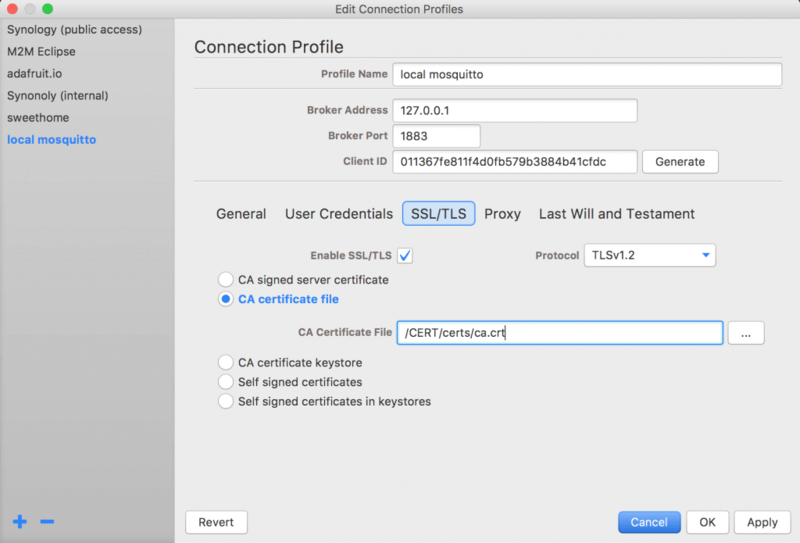 The ad-hoc connection allows to establish a broker connection by the entered host address and port to connect via profile the connection is made based on the chosen profile. 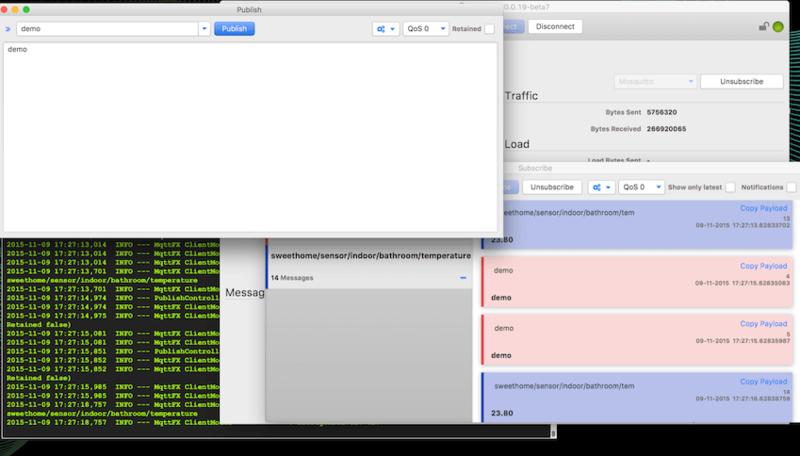 Messages are published via the „Publish“ tab. 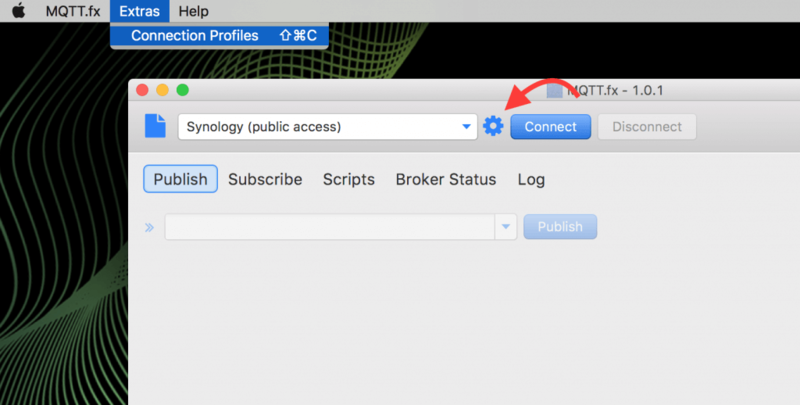 Once the broker connection is established, the topic to publish can simply be entered in the drop-down field. 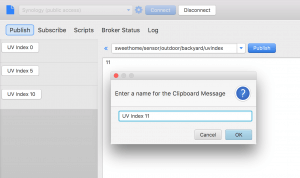 The big text area contains the message body a click in „Submit“ sends the message to the broker. Messages can also be stored by name on a clipboard for re-usage. A stored message is then send my just a click on the named button. Topic subscriptions can be made via the „Subscribe“ tab. 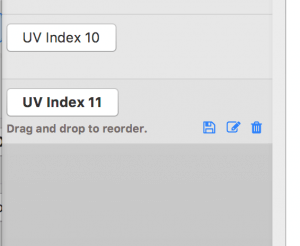 Like in the „Publish“ context, the wanted topics is to be entered in the drop-down-field and subscription is done via the „Subscribe“ button. Subscribed topics are stored in the application configuration for later usage and can me chosen from the drop-dow list. Registered topics are listed on the left in the „Subscribe“ tab and can be unsubscribed by click on the „-“ icon (or by being selected and a click on „Unsubscribe“). For better identification a color can be set for each topic. Received messages are colored according to the chosen topic color. Some brokers are supporting sending messages to a certain topic hierarchy stating with „$SYS“ to provide internal status information like via „$SYS/broker/version“ the broker version can be get or the broker uptime is provided via „$SYS/broker/timestamp“. 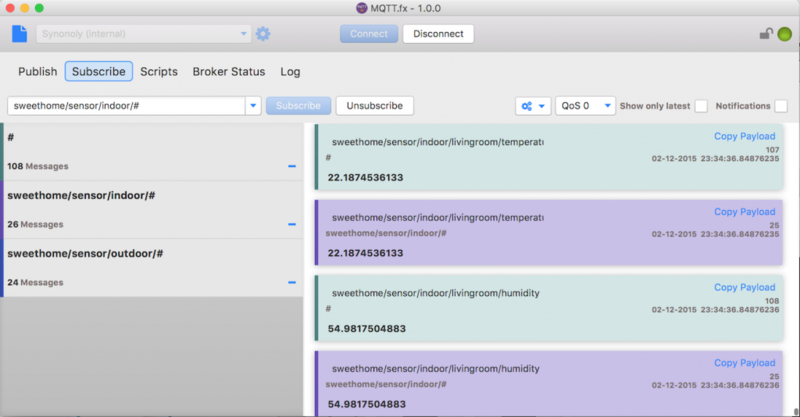 Currently MQTT.fx supports HiveMQ and mosquitto. 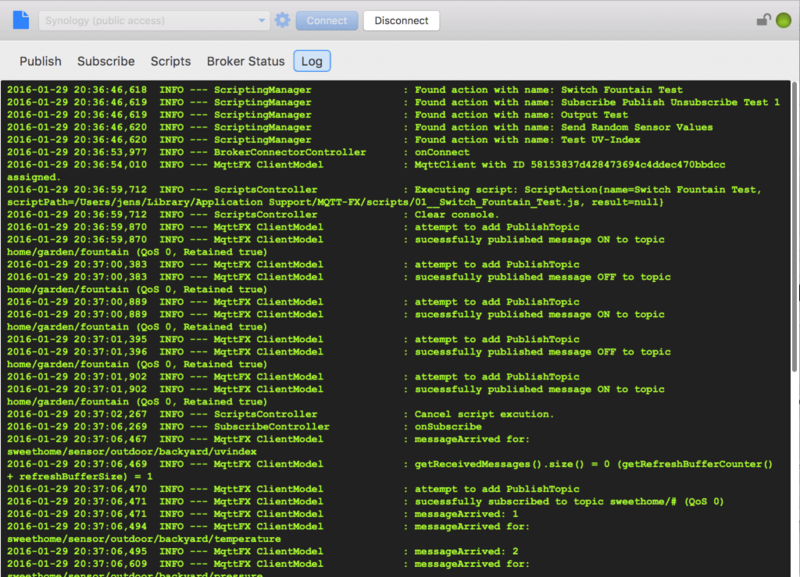 The „Log“ tab shows the logging console. The same information is also written to the mqttfx.log file located in the application configuration folder. 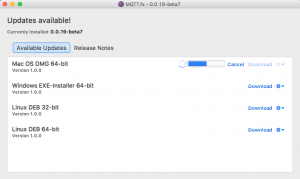 Bundled installation packages for Mac OSX, Windows and Linux are available at https://mqttfx.jensd.de/. “Bundled” means, the Java Runtime Environment to run the application is already included by the Installer, so no pre-installed JRE is needed. The bundles JRE is used only to run MQTT.fx. It is not installed on the System. Jens Deters started with (home-) computing about 25 years ago. 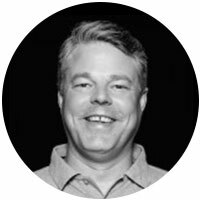 During the last 15 years he owned several roles in the IT & Telecommunication sector (Software Developer, Trainer, Consultant, Project Manager and Product Manager). His major passion is still developing software. Today he works as a Senior IT Consultant and at codecentric in Germany. 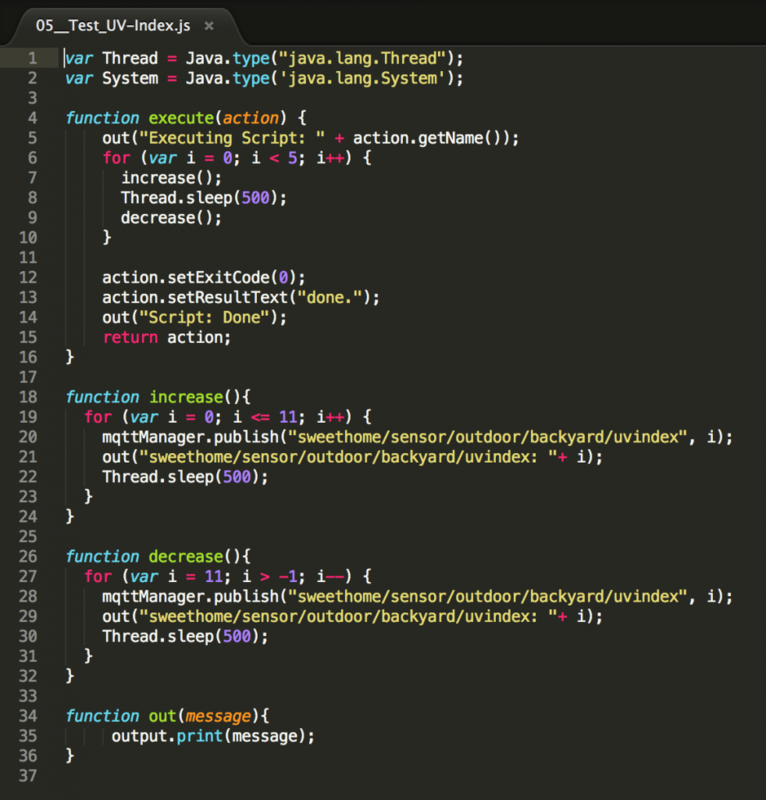 He regularly blogs about his projects to contribute to the JavaFX- and IoT-Community https://mqttfx.jensd.de/. Jens is also member of the NetBeans Dream Team.